We’re proud to announce that our latest Buildbox Games release, Shadows, was featured by Apple in over 20 different countries including Australia and South Korea. It was also featured in the US for Best New Games for each category and has already reached an impressive 100,000 downloads within its first week. Created by Sven from Daily Life Apps, Shadows is a unique avoidance puzzle game with a dark mysterious vibe. Players are literally transported into a world of intricate mazes. The combination of shadow illusions and haunting special effects makes it stand out from the typical arcade puzzler. The gameplay is not only challenging and addictive but extremely fun as well. The goal is simple: Don’t touch the borders, but it’s not as easy to do as it sounds. Players have to be quick and strategic with each move. There’s also hidden stars to collect and new characters that can be unlocked. 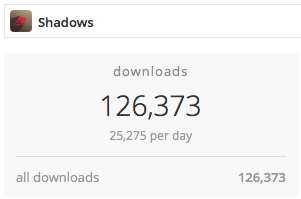 Shadows is a great example of the type of success that our developers are having when they work with our awesome Buildbox Publishing Team. If you’re interested in being published by us, simply send an email to support@buildbox.com with a video and 3 screenshots of your Buildbox game for consideration.